I saw a local production of The Nutcracker (Arts Ballet Theatre of Florida) that was so cute. It was cast almost totally with kids and they were all so proud to be on stage. The audience was filled with their families who were even more excited to see their children perform. A mom sat next to me who kept waving at the stage as if her child could see her seated out in the dark. It didn't stop her and she kept waving. That's such a mom thing to do. I think sitting in that audience really gave me the Christmas spirit. Afterwards we went to a Chinese All-you-can-eat buffet and I ate all I could. I even stuffed almond cookies in my jacket for later. Tonight I'm finishing up writing the concierge newsletter for Where Magazine as tomorrow I leave for Virginia where it's very cold. I biked to Lincoln Road this morning and it was 61 degrees. I was freezing so I know I'm really going to freeze in Virginia with temperatures like 28 degrees. BRRRRR! Merry Christmas everyone. Talk to you when I return. I miss the stray cats already. 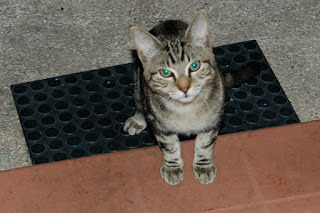 PHOTO: One of the stray cats that comes to my door several times a day for me to feed.